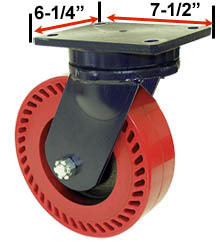 These are large, high-capacity casters, with wheels up to 5" wide and overall heights to 19". 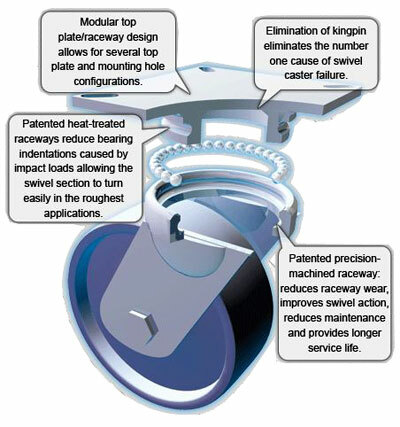 Patented Kingpinless design means that they will swivel better (even under massive loads) and last longer. Casters are finished in Laguna blue paint, and available in multiple wheel options. High-strength cast iron V-Groove wheels are machined with a 90 degree groove for operation on inverted angle iron track. They are used to control the flow of a load (into an oven, between machines, over long distances, or where "production line" sequences must be maintained). Mounting Plate:6-1/4" x 7-1/2" x 1/2"
The 95 Series typical applications include dollies, utility carts, tow line and platform trucks. It is also ideal for: tow lines, shock load applications and abusive conditions, production line dollies & trucks used in various industries including but not limited to: boat and ship molding and building, automotive, aerospace, metal fabricating, metal forging, heavy machinery and equipment, military equipment, mobile homes, etc. Tractor pulled trailers, extreme duty platform trucks and material handling carts, air cargo and ground support equipment, storage tanks, gantries and heavy duty processing equipment, coliseum and gymnasium equipment, shipping/receiving carts, warehousing and freight terminal dollies and carts, and countless other heavy duty applications.